The Avaya IP406 V2 is a versatile and expandable control unit that leverages the full functionality of the latest IP Office features. Whether you choose analog, digital, or IP trunks or stations, the IP406 V2 can satisfy your communication needs. 8 LAN Ports - Eight port unmanaged layer 2 ethernet switch. Ports are full-duplex 10/100Mbps, auto-sensing, and auto MDI/MDIX. 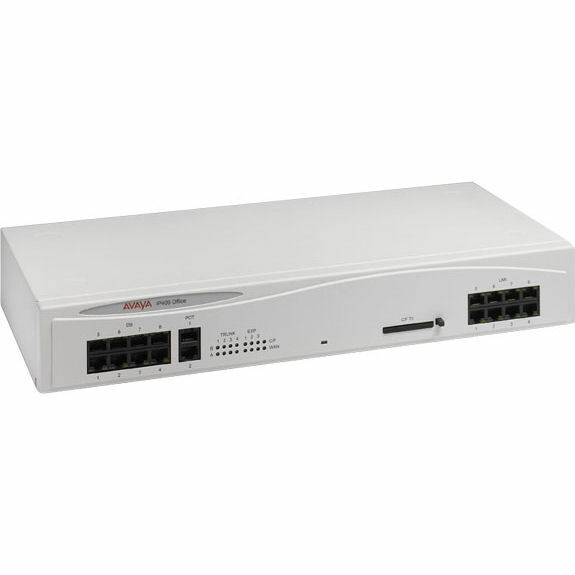 Used for PC and server connectivity as well as for connecting the optional IP400 WAN3 and IP telephones. 8 Digital Station Ports - Compatible with 2400, 4400, 5400, and 6400 series digital telephones. Also compatible with 3810 and TransTalk 9040 wireless. 2 Analog Station Ports - Used for connection of analog telephones and devices. Not suitable for out-of-building connections. 1 VCM Expansion Slot - Compatible with VCM 5/10/20/30 and VCM 4/8/16/24. Maximum voice compression channels capacity of 30 channels. Maximum Extensions - 190 of various types in combination. Analog only: 182. DS Only: 188. IP Only: 190.